Last November, Caitlin Riney went and did something spectacular and opened a much needed men's clothing store on Michigan Ave. in Corktown. Caitlin created her drive to open George Gregory out of the dislike for her job, feelings of homesickness and the happiness she found developing her personal style. So she packed her bags and moved from Chicago back to her home state of Michigan! 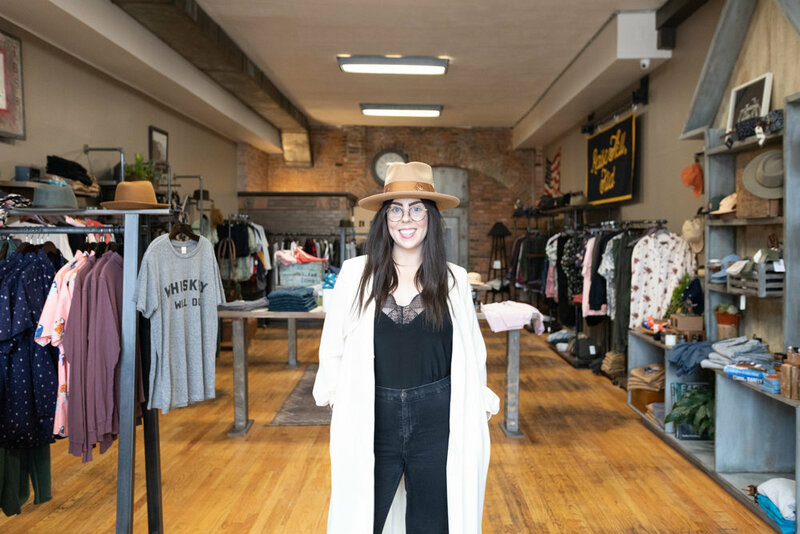 We dig Caitlin's eye, love for Detroit and overall bubbly demeanor that shines through - all of these qualities make shopping with her a super enjoyable experience. George Gregory brings the boutique feeling back to menswear shopping and will make even the most manly of men enjoy trying on a few things! 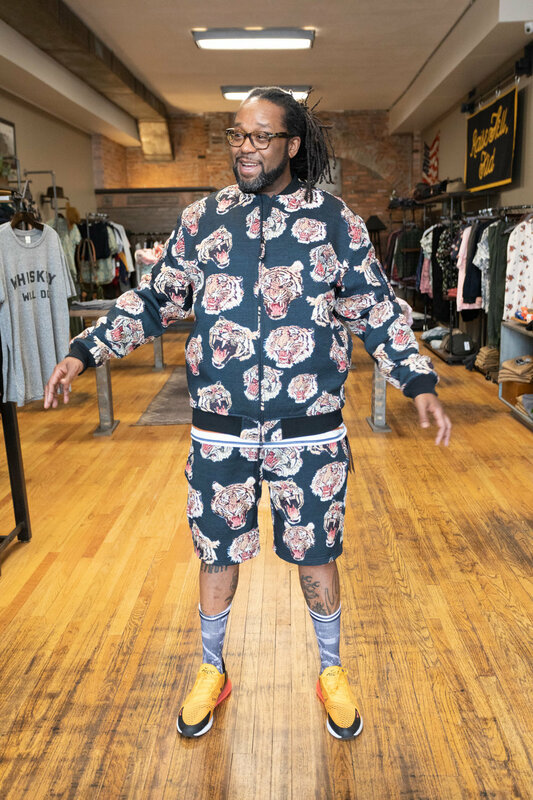 Jason Hall of Slow Roll Detroit all tiger'd out! 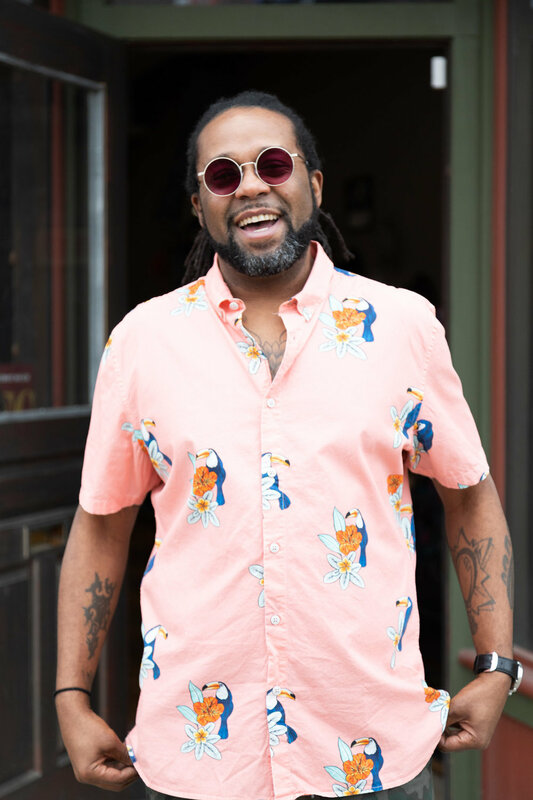 As soon as I saw Caitlin's space and clothes, I knew that co-founder of Slow Roll and my pizza-loving bae - Jason Hall - would be the perfect model to bring the clothing to life. J has a dapper style with a swaggy twist so I styled him in lots of unique and fun, mixed patterns to bring out his flavor and show his fun personality. You can pick up all the styles seen here in store. Everything in the shop is well designed and thought-out from the boutique's vintage floors and walls to the threads for purchase. George Gregory, named after Caitlin's brother and dad, carries a variety of menswear brands sizes S-XXXL. Selling brands such as Yellow 108, Bridge & Burn, Civil Society and Ebbets, the man in your life is sure to find something here that other large department stores won't have - one-of-a-kind vintage finds, business casual slacks or a perfect t-shirt for a night out with friends - there's truly something for everyone here. Shoutout to Caitlin for this perfectly and unique collection! George Gregory's main goal other than outfitting men in the flyest threads is for people to leave the space (at the very least) in a better mood than when they entered. After our shoot with Caitlin we were flying high for a whole week - and you will be too! George Gregory is open Tuesday to Saturday from 11 am to 6 pm and Sunday from 12 pm to 5 pm. The shop is located right in the heart of Corktown at 1422 Michigan Ave.
Stop by George Gregory and tell Caitlin we sent you!